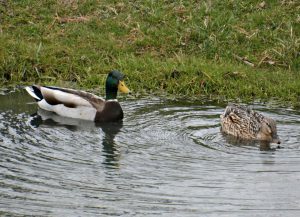 It’s a sign of spring for me when I see a pair of Mallards hanging around our pond. You can see them paddling in the water together, feeding on the vegetation together, and taking walks together around the pond. I am not sure if they have a nesting spot yet but it sure seems like they have decided on a place in my neighbor’s yard somewhere. You see I have observed this couple waddling up the grass towards his house quite a few times. I’m thinking that the nest may be under his bushes on the ground somewhere as that is the Mallard Duck nesting habit. The female will build a shallow bowl type nest using the plant materials around her. The nest is usually on the ground and hidden under vegetation so predators can’t find it. That’s what Mallards like to do. They will seek a good nesting spot which can be up to a hundred yards away from water. Water as in a pond, a marsh, a stream, or lake. In my case it is our pond which has been the breeding grounds for a number of Mallard pairs over the years as well as Canada Geese (but that’s another story). 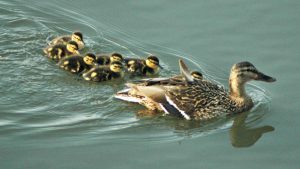 It can be a lot of fun watching the ducklings as they follow their mama (hen) around in the water and in our yard too. It can also be very painful to watch sometimes. When my husband and I first see them we take a count of how many ducklings there are (can be up to 12) because as the days go by this number will probably drop quite a bit due to predators. Predators such as raccoons, hawks, and snapping turtles who swallow them whole in the water. I know, it sounds terrible but unfortunately it is a natural occurrence in nature. As long as I do not witness it, I can handle it. Don’t get me wrong, it is still sad to see the hen walking around looking lost when she loses one of her babies. In the end there may be about four or five of the ducklings that survive. Sometimes more, sometimes less. Drakes seek a mate in the Fall and will remain with them until breeding season which is usually early March into May. Females are said to breed near the place where they were born. When the males begin to mate in the Fall, their heads are a metallic green. However once they start breeding that color is more purple/blue in appearance. Females can lay up to 12 eggs. It takes twenty eight to thirty days to incubate the eggs. Once the eggs are incubated they will hatch within two days. One day later after the eggs have hatched , the hen will take her ducklings to water to teach them to swim. Ducklings will follow their mama for the next fifty to sixty days. 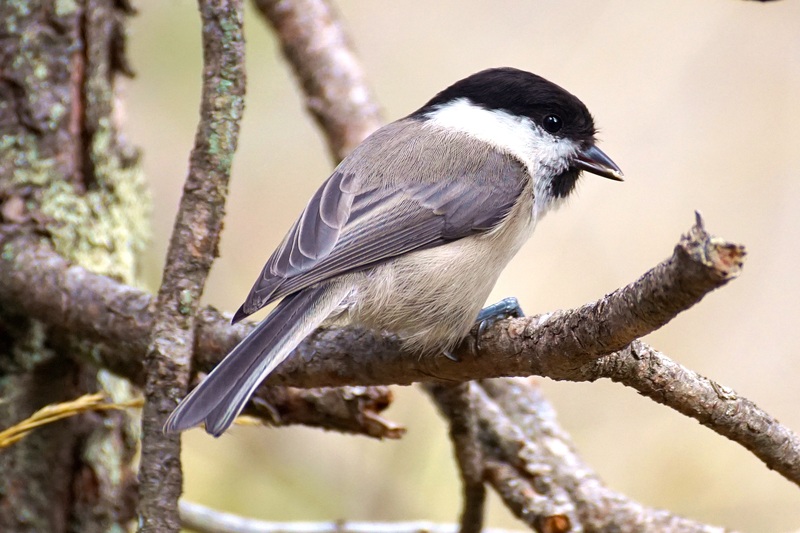 Both young males and females look alike until they shed their feathers (before winter) and grow new feathers revealing their respective gender. Mallard Ducks are known to breed with a variety of domestic breeds of ducks. These are called hybrids. The young will fly approximately two months after hatching. Mallard Ducks can be found throughout the Northern Hemisphere. They are the most familiar and most populous one that you will see around. Find them on ponds, lakes, rivers, in parks, and in your own neighborhood. You will be able to identify the wild Mallard Ducks over the domesticated Mallards by the way they react to your presence. Wild Mallards will fly away almost immediately within a human’s presence while a domesticated one will walk right up to you looking for food. For this reason, not all parks want you to feed them. They want the birds to stay wild which is really as it should be because parks can become overpopulated with them. Mallard Ducks eat mostly aquatic vegetation. You will see them duck their head underwater with their butts in the air as they feed on pond weed. They will also eat insects, worms, fish, grass seed, wheat and corn. It is the female who makes the quacking sound. The male has a raspy type sound. Mallards shed all their flight feathers at the end of the breeding season and are flightless for 3–4 weeks. They are the most heavily hunted duck in North America. Their body length can be twenty to twenty-eight inches. Their wingspan from thirty to forty inches. You may see Mallard Ducks in your own backyard, at your local park paddling in the lake, or just about anywhere. This duck is the most well-known and abundant in the northern hemisphere. Some are wild ducks, some are hybrids that have mated with other species, and some are domesticated…being very comfortable with humans. You will know the wild ones as they do not let you get too close to them and fly off to another location. Males and females get together in the Fall and stay together until breeding time in early March and up until late May. The female is the only one who incubates the eggs and also raises the young. The male leaves about ten days after incubation time and will gather with other males for the summer months. Once the babies hatch the mama takes them to water to teach them to swim. The new hatchlings will follow her for the next fifty or sixty days when they are able to take care of themselves. Then they are on their own and will leave the area. However, I have seen a family that we had return to our pond. How do I know? Well, I could be wrong but it was the fact that it was the same number of ducks that just left a few months prior and after observing them for a few months around the yard and pond you just know. They are like family ;-). Do you have Mallard Ducks where you live? What is your experience with them? Please feel free to make your comments below. Posted in Ducks, Geese, Shorebirds. How far south do mallard ducks live? I am not sure if I have ever seen one down in Florida. We do get ducks but they look different than the picture you showed. Where would be the closest place I need to go in order to see them? Tony, thanks for your comment! Mallard ducks can be found in Florida. Many will migrate to Florida for the winter but some will stay. I have seen them in spring, summer, and fall there. I have never been to Florida during the winter months. We have a male and female that came into our yard last year and I think the same ones just a few days ago. I’m worried about them cause we don’t have a pond close. Last year we didn’t see them with baby’s so cats or squirrels might have gotten them. I just hate it not knowing if they are going to be safe!! Betty, female mallards may build their nests up to a mile or more away from water. The tricky part is when the young ducklings hatch as the mother will lead them fairly quickly to water that she knows where to find. If it is a longer trip it is more hazardous for them (i.e. cats, raccoons, etc. eating them). Unfortunately, there is nothing you can really do for them other than hope for the best. It’s better to let nature take its course than to intervene. Hopefully, you will get to see little ducklings this year and be able to watch them grow. I have a mallard duck that has made her nest at the back corner if my garage. Now it is near where me and my brother park our vehicles, on a paved area that is paved to the side of the garage. Also the nest is right by where I and my tenants walk to our garbage cans. The location this mallard chose to make its nest is odd do to the traffic of us people and vehicles. And my house is located over a mile away from lake Michigan and there is maybe a pond at an cemetery that maybe a mile away. The distance from a water source is hampered by a lot of houses and streets, I do not think the duck and its ducklings will be able to walk to either water source. But all I can do is hope for the best!! I do have pictures of both the male and female ducks. Patrick, mallards sometimes nest in the oddest places. Their nests can be up to a mile or so away from water too so that is not unusual. The problem is when the ducklings are born and they try to travel to the water. It can be a little hazardous for them. You’re right, all you can do is hope for the best because you just never know. Keep me posted… I would love to know how it all works out. Thanks for your comments. We recently moved into a new home with a pond. A pair of mallards have been frequent visitors to the pond and yard. On Wednesday we saw them with 9 ducklings in the pond and yard. They seemed very happy there but by Thursday afternoon we do not see any sign of them. Our yard and pond is fenced and we don’t see any sign of predators. Any idea where they could have gone or if they’ll come back??? We have not seen them for two days. Anne, mallards tend to move around to other nearby ponds I have found, and may or may not return. It depends on the momma and whether she finds it safe there for her ducklings. We have had a family visiting off and on too. Sometimes they stick around the whole time and sometimes they just move. Keep an eye out and let me know what happens. Thanks for your comments. We have had a nest under some bushes in the front of our house for 11 days. The mother was sitting on the six eggs yesterday. Today. All the eggs are gone and the mother is gone. No shells are around. We had food and water out for the mom. It is a mile to the reservoir . There is a very busy road to cross to get to the reservoir. Hi Brenda, I hate to say it but a predator such as a raccoon may have been the culprit since there is no sign of egg shells. A raccoon may have stolen the eggs to eat the contents somewhere else. Snakes will eat the eggs whole. It’s unfortunate but that is nature at its best? If you do end up seeing the mother again with babies I would be interested in hearing about it. Mallards will nest up to a mile or so away from water by the way. Why they do it especially with a busy road to cross with their young is beyond me. I guess it is all in the navigation. Thanks for your comments! How old do ducks have to be to lay eggs that will hatch? Last year we saved a bunch of ducklings that somehow ended up in a sewer by our home. This year, exactly a year later, we had a Mallard start a nest in our landscaping. We are hoping that she chose us because she’s one of those babies that we saved last year. Or maybe the same mama? Either way, there are now 9 eggs and she is here to stay for the next month now. She chose a high traffic area so we are doing our best to conceal her from neighbor kids and prey and to respect her privacy. I can’t wait for the babies! Hi Carrie, mallards start their breeding at 1 year of age. It is highly possible that the one in your yard nesting is from last year’s babies. 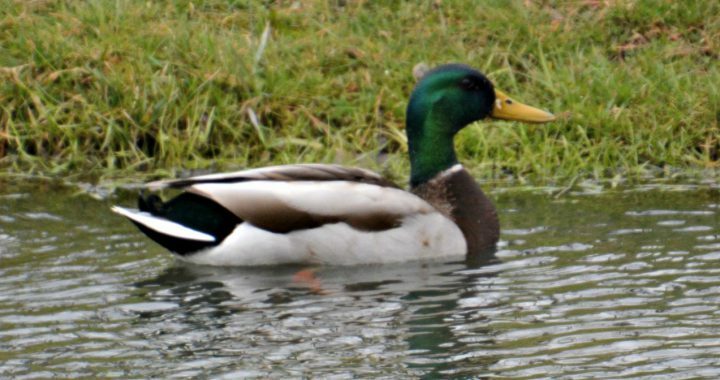 Mallards tend to return to their place of birth for breeding. Hopefully you will get to see babies very soon. It is so much fun watching them grow. Keep me posted on how they do. I would love to hear about it! Thanks for your comments! I have had a mallard couple visiting since early April and they are still together. Does this mean that they are having trouble producing eggs? Also, now they walk, they do not fly away anymore. They havent flown off for several weeks. I dont understand why they are not flying anymore. The enticement in my yard are black oil sunflower seeds and a nice spruce to lounge under!